Apparently, wealthy consumers, particularly Americans, are essentially an untapped market for cruise lines, according to a global wealth study reported on by Travel Weekly. With the global penetration of upper-income consumers by cruiselines estimated at just 1.2%, a focus on this segment of the market seems like a no-brainer. Is it? Well, let’s look at some research that reveals the needs and desires of wealthy travelers to understand what cruise lines can, and cannot, reasonably deliver. Coyle Hospitality Group recently surveyed 5,000 travelers about their best hotel experiences, and one of the most revealing data subsets was the specific attributes that topped the luxury guests’ preferences. If, in fact, the luxury market remains largely untapped for wealthy travelers, it would be useful for cruise operators to take a look at what luxury hotels are providing and what makes the biggest impact. The table below shows that the luxury traveler expects personalized service. Many of our results support findings by hotel mystery shoppers. The most often cited positive attribute used to describe personalization was the use of surname (greetings especially) across numerous guest contact points. That is, the concierge, stateroom attendant, server, front desk clerk, bartender, etc. all must use the guest name to impart a a sense of recognition among luxury guests. The second most-often cited personalization centered around recognizing a special occasion. Remembering a birthday or anniversary, and commemorating it in some way, makes a big impact. Assuming every cruise vacation, especially a luxury one, is a special occasion, this opportunity is a ripe one. Be warned, a fruit plate and bottle of mineral water in the stateroom will not be considered a sincere effort. 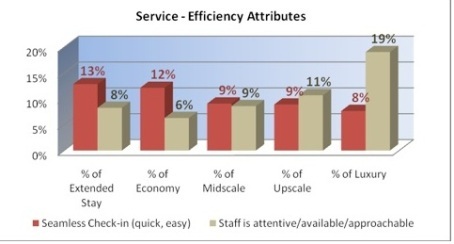 In hotels, a key differentiator between the luxury category and all other segments is the ratio of staff to guests. In Asia in particular, where luxury service has its own lore, it is not uncommon to have a guest-to-staff ratio of 1 to 1 or even lower. Even in the Western Hemisphere, where labor costs are higher, luxury hotels maintain high staffing levels in key guest contact areas such as the front desk, breakfast area, lounge and door. Luxury travelers expect to see continuous evidence that staff members are at the ready. Coyle’s mystery shoppers report extensively on this area of the guest experience. The research also suggests that luxury travelers care less about certain aspects of the service delivery than those purchasing in the lower segments. This area perhaps presents the biggest challenges to cruise lines since the guest activities tend to be less individualized, especially if the ship is large. Many guests want things at the same time, from breakfast to accessing excursions to getting a south-facing pool chair. Choices are much more limited in the cruise environment than in a luxury hotel, where guests can come and go at will. That said, it is probably okay for the pool to be very busy during an at-sea day, so long as there’s an undeniable presence of staff ready to assist. Cleanliness remains king when it comes to accommodations, there’s no surprise there. This is followed in importance among guests by room size and views, across all hotel segments. Our study found that the quality of the bedding and bath amenities were the most important differentiating attributes between luxury hotels and other segments. Brand names of bath amenities were often mentioned in this luxury group, as well. In summary, if cruise lines want to tap the wealthy demographic, they need to address what these luxury travelers expect and demand. That starts with plenty of available staff, minimal lines, sincere recognition, and excellent soft goods in staterooms.